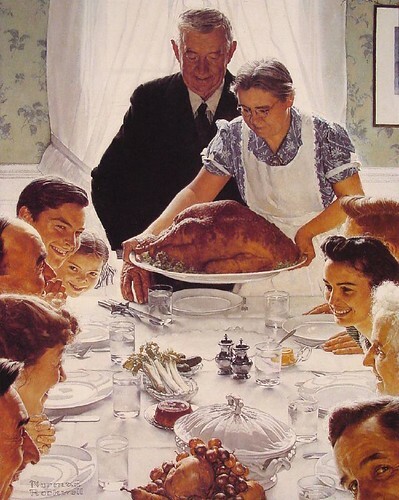 Norman Rockwell epitomizes the ideal image of America: wholesome, earnest, and innocent. His expertly crafted images are both humorous and sobering in their detailed portrayal of mid-twentieth century America. It’s a view that sees Americans as trying to do the “right” thing: feeding the needy, educating all citizens, rescuing those in peril. The image above, Freedom From Want, typifies this outlook and his style, and is cited most at this time of year. I’ve created a Flickr gallery of other Norman Rockwell images addressing Freedom From Want and other themes.